Hoggarths is a working sheep farm breeding pedigree Swaledale sheep. These hardy sheep are largely responsible for shaping and maintaining the dales landscape. You will see them grazing next to the campsite and witness the seasonal farming activities close at hand. During March the shearlings (female sheep, in lamb for the first time) are brought down from the moors and put inside for extra care before their young arrive. April and May are special months in the farming calendar as this is when the lambs are born. At this time of year the fields and buildings are full of new born lambs and their mothers. You may even get the chance to bottle feed a few! At the end of May Tan Hill Sheep Show takes place. The show is for the Swaledale sheep only and is an important event for all involved in the breed. 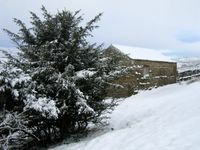 The show is unusual in that it is held on ground next to the Tan Hill Inn which is the highest public house in England . In June the fields are clothed with golden buttercups and dozens of other wild flowers. These flower-rich meadows are protected and are allowed to grow and seed before the grass is cut for hay to ensure that the meadows will be full of flower year after year. This is one of the prettiest times of year in the dales. In July haytime begins and, although some fields are made into large round, plastic covered bales, thousands of small bales are still made and stacked in the buildings ready to feed to the sheep during the winter months. This wonderful hay is the best natural air freshener you will ever find! During July and August the sheep are gathered for shearing. As the weather gets warmer and warmer the sheep are glad to be rid of their woolly coats. The fleece is sheared off in one piece then is expertly folded and packed ready to be sent the Wool Board. Some finds its way to the Swaledale Woollen Shop in Muker but the majority is made into carpets. As August progresses the heather covered moors take on their purple hue. The first Wednesday in September is the date of Muker Show: the high point in the local farming calendar. Vintage tractors, dry stone walling demonstrations, sheep dog trials, junior & senior fell races, children's fancy dress, produce & craft exhibitions can be seen, to name but a few. The show concludes when the Muker Silver Band plays outside the Farmer's Arms in the centre of the village. Crowds of people gather to join in the singing making this a warm and memorable occasion. October is the month when the breeding sheep, both male and female are sold at Kirkby Stephen and Hawes. The Tup (ram) Sales are an important time for farmers with pedigree stock. It is at these sales that the tups, the pride of the flock, come under the scrutiny of fellow farmers and breeders. If you visit us in November you may wonder why the sheep have coloured backs. November and December is tupping time! Special colouring is applied to the underside of the tup so that the farmer can see how busy he has been!!! During December the dale looks forward to and prepares for Christmas. Carol services, Christmas lights, children's parties and visits from Santa take place in all the villages. Farmers continue to tend their stock whatever the season and frequently gather in the flocks to check their wellbeing. This is when you will see man and dog working together. All the technology in the world cannot replace the loyalty, stamina and skill of the working sheepdog.